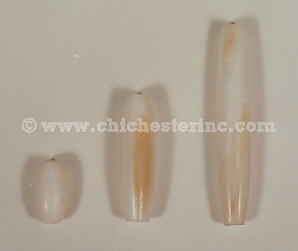 From left to right: 0.5", 1.0", and 1.5"
The fresh water clam shell hairpipe is the same shape as the regular bone hairpipe. Please note that the holes on the clam shell hairpipe are much smaller than those in the bone hairpipe. Think of these as spaghetti beads. You will not be able to string these with deerskin. The clam shells we use for this hairpipe are not endangered.